Our engineers develop pioneering control and display systems for vehicle interiors. These are central operating elements, climate and audio panels as well as fully integrated center stacks. Alongside precise classical mechanical solutions with keys, buttons and rotating actuators, BHTC focusses on the area of multi-touch displays. Displays are the central interface to the user. Our technology experts are constantly on the look-out for new ideas and solutions to improve user experience even further. The focus is on comfort and safety as well as on revolutionary technologies. New display technologies, the integration of tactile effects, acoustic feedback, innovative materials. and other exciting topics are setting the trends for the interiors of the future. BHTC supplies no fewer than three revolutionary products for the interior of the new Audi A6. The first of these is the 10.1-inch Center Information Display (CID), which is used to visualize and operate various infotainment functions such as navigation or audio. Directly underneath the CID, there is a further 8.6-inch display. This is used to control all the comfort functions. Navigation destinations or contacts can be entered conveniently through handwriting on the display. The absolute highlights of both displays are the force measurement and the pioneering tactile feedback combined with acoustic feedback. It goes without saying that BHTC is implementing cutting-edge technologies here, too, such as an in-house developed actuator which permits non-regenerative tactile feedback. The display operating interface is stimulated accordingly and operation can be felt (tactile feedback). This takes place without undesirable mechanical transmission to the vehicle cockpit. BHTC has succeeded in digitizing the user experience of a conventional mechanical key. Ergonomic studies by BHTC have shown that in addition to the increased user experience there is also a significantly lower degree of distraction. Operating comfort and safety have both been taken into equal account. We also aim to be leading the way in terms of display and screen quality. Both displays use in-cell technology, which combines imaging and the recording of touch data on one display layer. This has led to a significantly better reproduction performance and allowed for the display to be designed much slimmer and lighter. 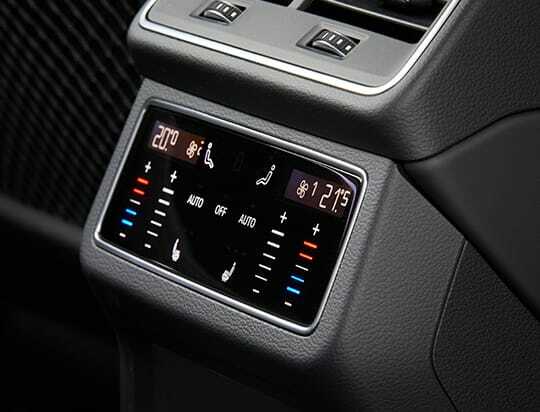 Yet that is not all – the climate control panel in the rear of the Audi A6 can also be operated using touch technology. The glass look with black panel effect gives the interior a tidy appearance. 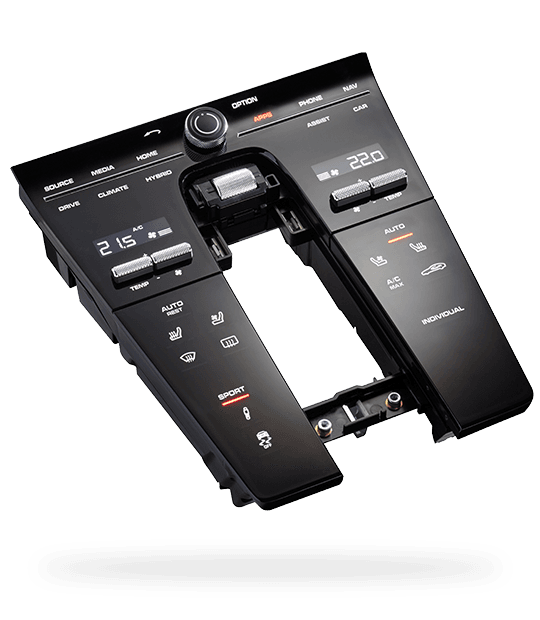 The intuitive operation is rounded off by the acoustic feedback from sliders and buttons. The BHTC four-zone automatic air conditioning creates an individual feeling of comfort for driver and front-seat passenger as well as for both seats in the rear. The center stack is used for controlling both climate functions and central vehicle functions. To avoid functions being triggered unintentionally, the so-called force-sense technology is used for the Porsche Panamera. The control panel has to be actuated with a certain force for the function to be executed. The combination of tactile and acoustic feedback makes users feel they have pressed a real button. A further component of the four-zone automatic air conditioning is an additional touch screen in the rear. 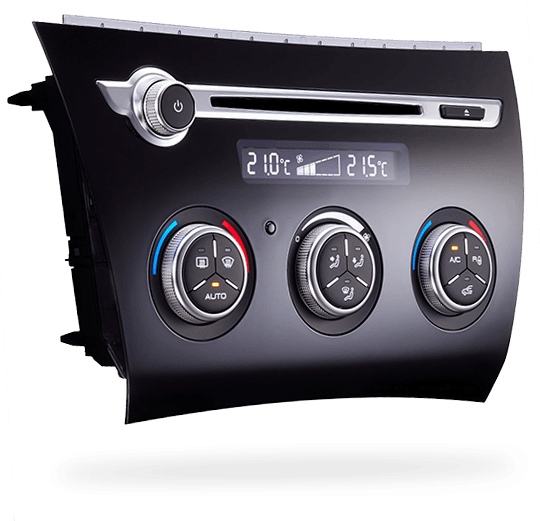 This can be used to operate further comfort and entertainment functions as well as for climate control. The high-quality 3D graphics are made possible by a 3D graphic board specially developed by BHTC. BHTC supplies an intuitively operated HMI (Human Machine Interface) device for the pioneering electric vehicle BMW i3, with the device integrating operation of both the air conditioning and the audio system. 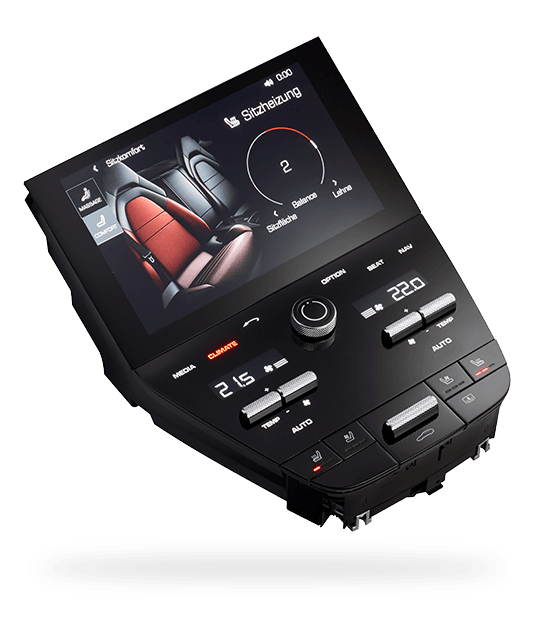 In a style typical to BMW, audio operation can be configured by the assignment of functions to favourite buttons. As soon as the buttons are touched, the assigned functions are visualised immediately in the driver information display located above. Temperature is selected using a high-quality rotating actuator, with temperature displayed in its center. Finishing and workmanship quality perfectly complement the ergonomic interior. Since the introduction of the Haval H7, BHTC has been supplying the Chinese manufacturer with an HMI operating concept – comprising a two-zone automatic air conditioning including CD slot. The climate control of the Chinese SUV is operated using three rotating actuators. The set functions are shown on the display above these. 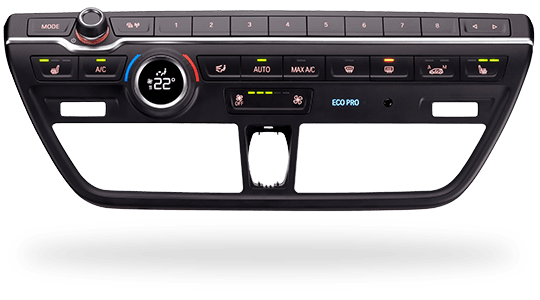 Framed in a black trim, the control panel fits in perfectly with the high-quality interior. Audi, BMW, Great Wall, and Porsche.